I'm kinda glad it was though, because it provided an opportunity for some amateur armchair astronomers to sort of have a share in the way science works in weeding out wrong ideas. We have now entered a new era of astronomy: gravitational wave interferometers (constructed by the LIGO/VIRGO collaboration) have enabled us to observe astrophysical objects through the medium of gravitational waves. More than this – we recently detected gravitational and electromagnetic radiation from the same neutron star merger event in a historic example of multi-messenger astronomy. Gravitational wave detection is a tool we can employ to probe astrophysical phenomena that were previously invisible to us. Planet or otherwise, Pluto’s not some lonely chunk of rock lurking around the edges of the Solar System – as previous astrobites, such as this one and this other one, and gorgeous pictures from the New Horizons spacecraft have shown. Pluto has not one, not two, but five satellites (natural satellites, not artificial ones), which make up its complex five-moon system. The largest of the moons is Charon, which is half the length of Pluto and one-eighth of Pluto’s mass. The other four moons, in order from closest to farthest from Pluto, are Styx, Nix, Kerberos, and Hydra. Altogether these moons make up quite a peculiar system; all five of them, for example, have orbits which are almost perfectly circular and nearly coplanar (aka, lie in the same plane). Moreover, the smaller moons’ orbital periods relative to Charon fall near some very neat intervals of 1:3:4:5:6 – meaning that the orbital periods of Styx, Nix, Kerberos, and Hydra are about 3, 4, 5, and 6 times the orbital period of Charon, respectively. So what sort of astrophysical phenomenon led to such a nicely oriented orbiting system? The answer is still unclear. Scientists do think they have a pretty good explanation for how Charon formed. Scientists discovered Charon back in the 1970’s, and nowadays the most widely accepted idea for Charon’s formation is the intact capture scenario. This scenario says that Charon formed back when the Kuiper Belt was a lot more crowded with objects; at some point, Pluto collided with a Kuiper Belt object and captured the impactor into orbit, and that impactor became Charon. After the collision, tidal evolution (which would have slowed down Pluto’s spin and pushed Charon’s orbit outward) helped bring Pluto and Charon into the orbital system that the two have today. Pluto’s four smaller moons, on the other hand, are recent 21st-century discoveries, and their strange orbits have yet to be explained. There are a number of proposed formation scenarios out there, but scientists are still trying to find a scenario that completely and consistently explains the complex moon system that we observe today. With advances in technology and more time dedicated to deep sky surveys, we are able to probe deeper and deeper into the universe. Today’s astrobite is about a new discovery of the most distant quasar – an incredibly luminous active supermassive black hole – ever observed. It’s at a redshift z = 7.54: its light has been traveling towards us for 13.1 billion years, from when the universe was only 690 million years old. So why is this interesting? Surely as we look deeper, we’re bound to find more “most distant” objects – it’s just a matter of time. But finding objects like these is challenging, and such discoveries can reveal a lot about the early universe. Warning – how you analyse your data can entirely change the interpretation of your results. Today’s paper shows the importance of multiple teams of scientists looking at the data and considering alternative explanations. The Transiting Exoplanet Survey Satellite (TESS) will be launching very soon (in about a month according to NASA’s launch countdown clock), and it promises to yield exciting results with a near all-sky survey for exoplanets around bright, nearby stars. Over two years, TESS will observe over 400 million stars by systematically scanning sectors of the sky for 27 days at a time (see Figure 1). About 400,000 of these stars will be studied closely, and will have light curves associated with them in data releases. The rest of the stars can be studied through full-frame images (FFIs), which have a 30-minute cadence and consist of TESS’s entire field of view. To clarify, this doesn’t mean that an observation is taken every thirty minutes. The TESS cameras take images every two seconds. To save on storage and transmission time those images are stacked to create new images with an effective exposure time of thirty minutes. 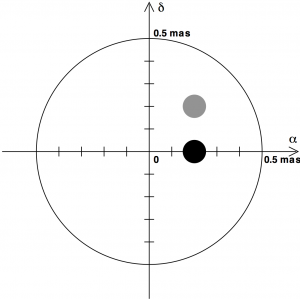 On March 1st, the first detection of a cosmic 21cm signal by EDGES was published in Nature (see here for an astrobite that discusses the background and explains the experimental results). This got people talking for two reasons. Firstly, because it was the first direct detection of the temperature of the hydrogen gas during the Cosmic Dawn era – a time when the first sources of light were formed – and secondly, because the gas appeared much colder than everyone was expecting. Not only that, but dark matter could have been responsible for that surprise. What has arms, a tail, and a big shell all around it? You may be tempted to say, “a turtle” (or maybe “an unhatched crocodile”? ), but an equally reasonable answer, it turns out, is “a galaxy”! Tidal interactions between a galaxy and the objects in its vicinity lead to the formation of a variety of visually striking structures, often referred to as tidal features (see figure 1 for a few examples). Streams form when a lower-mass companion (such as a globular cluster or a smaller galaxy) orbits a more massive galaxy on a relatively circular orbit and gradually gets ripped apart and stretched out by tidal forces. Shells are the likely results of a dwarf galaxy falling radially into and merging with a bigger galaxy. Tidal arms or tails form when material from the primary galaxy gets pulled out due to an interaction with a nearby large companion, usually as a precursor or a byproduct of a major merger (check out the arms/tails in this cool comparison of simulation and observations). 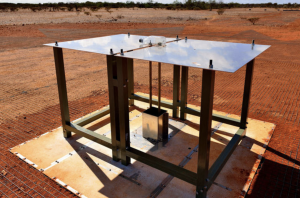 The Dragonfly Telephoto Array isn’t your typical detector. 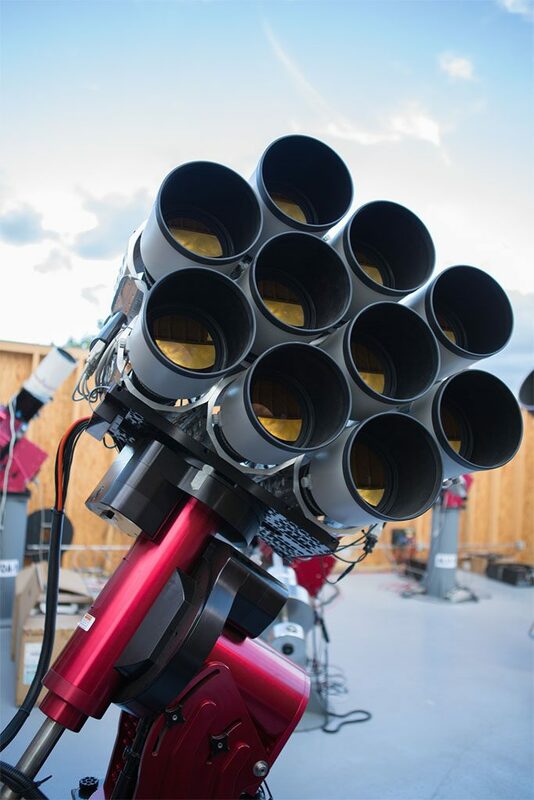 Consisting of 48 Canon 400mm telephoto lenses, Dragonfly has the unique ability to image dim diffuse objects, or low surface brightness objects much better than other telescopes can (check out Astrobites on some of the objects Dragonfly has imaged here, here, and here). This means that Dragonfly can probe the structures of galaxies for faint disruptions from interactions with their dark matter halos. 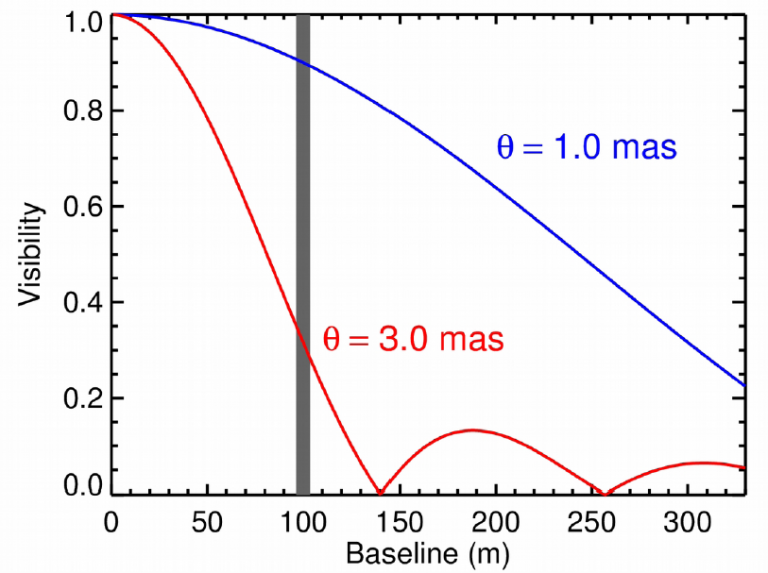 Relationships between the masses of dark matter and stellar matter in a galaxy have been determined but are poorly constrained for low mass galaxies in particular (low mass being 108 solar-masses or so). Low mass galaxies that are satellites to larger galaxies may hold the key to understanding galaxy formation and dark matter on small scales. More than 13 billion years ago, the Universe was dark and starless – an era referred to as the cosmic “dark ages.” Then, the first galaxies began to form. As clouds of gas cooled and condensed in their centers, the stars that were born illuminated the cosmos. These stars unleashed energetic ultraviolet (UV) photons, which bombarded the surrounding neutral hydrogen gas, separating it into charged protons and electrons, in a process called reionization (Figure 1). ... By studying dwarf galaxies in the nearby Universe, we can learn about reionization in the distant past. 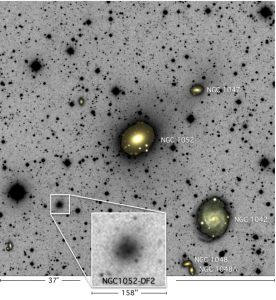 In particular, the nature of the dwarf galaxies we observe today depends on two things – the time when reionization occurred, and the mass cutoff below which star formation was shut off. Nearly two hundred and fifty years ago, Charles Messier, renowned comet hunter and chronicler of deep-sky objects, cataloged the passage of the first known Near-Earth Object: comet D/Lexell. Calculations of its orbit revealed that the massive chunk of ice and dust had hurtled past Earth at a distance of only 1.4 million miles—just under six times the Earth-Moon distance. It was due to return within the decade but was never seen again. How did we lose a comet?! 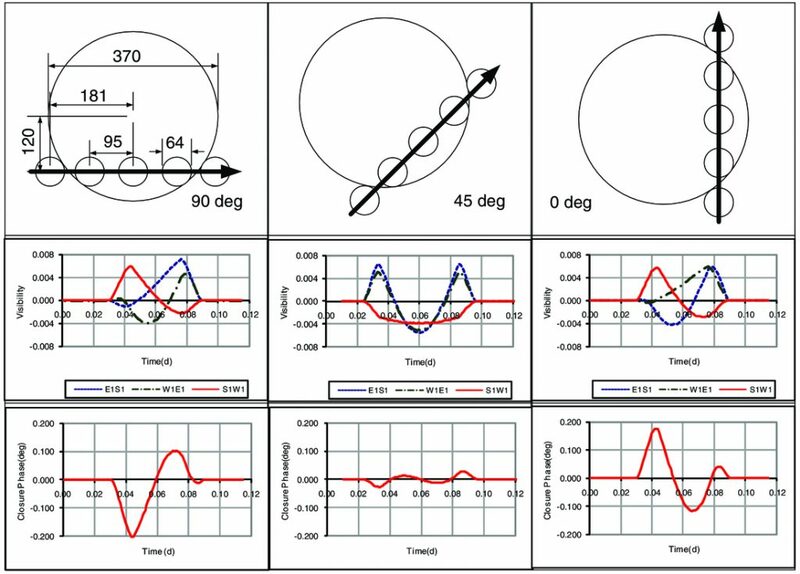 One technique for detecting and characterizing exoplanets is the transit method. 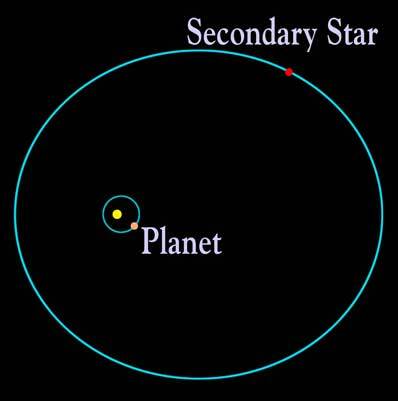 While we never directly observe the planet, we can detect it by observing a slight dimming of the host star’s light as the planet passes in front of the star. Observing this dip in different wavelengths allows us to infer the presence of chemical species in the planet’s atmosphere. But we must be cautious, because dark or light spots on the surface of the host star can contaminate the spectrum. (Check out this bite about the problem.) We have to monitor the host star for a long time to understand the surface variations, or, as silly as it may sound, actually resolve the face of the host star during the transit. Direct imaging has turned up a dozen or so exoplanets, out of a total of some 3,000. A dozen may not seem like a lot, but the direct imaging technique is useful for detecting massive planets on wide orbits, and for examining the planet’s thermal emission spectrum. Statistically Confirming an Earth-Like Planet? Not So Fast! Building a planet is a messy process, and astronomers are still unsure of how certain steps work. Planets are born from the same nebula that forms the star they orbit. As the nebula collapses, it flattens out, due to the gas’s angular momentum. This becomes the star’s protoplanetary disk, where the planets are born. Within this disk, small instabilities can lead to the growth of planetesimals. Some of these will continue to gain mass and will eventually become planets. How exactly they gain mass, though, is still up to debate. The two most popular models are core accretion and disk instability. In the core accretion model, planetesimals in the protoplanetary disk collide and stick together. Eventually the core will become large enough that it begins to accrete more and more material onto itself. In the disk instability model the disk becomes unstable when it becomes massive enough. This leads to small regions undergoing local collapses, forming planets. Combinations of the two theories have been proposed, but details are still being worked out. One large problem is that the time scale for disk instability is very short while core accretion takes a long time. There are also questions about whether or not planets remain at the distance where they formed. Discoveries like hot Jupiters raise questions about whether planets might migrate inwards or outwards from the star. The universe is a pretty efficient star making machine. Since around a billion years after the Big Bang, galaxies have been assembling and forming stars with abandon. Many of these stars have now died, particularly the most massive, which have much shorter lifetimes than less massive stars, and often end their lives in cataclysmic supernovae. But a number of low mass stars are still around from the very earliest star forming episodes. As a result, the overall density of stars in the universe has been increasing. 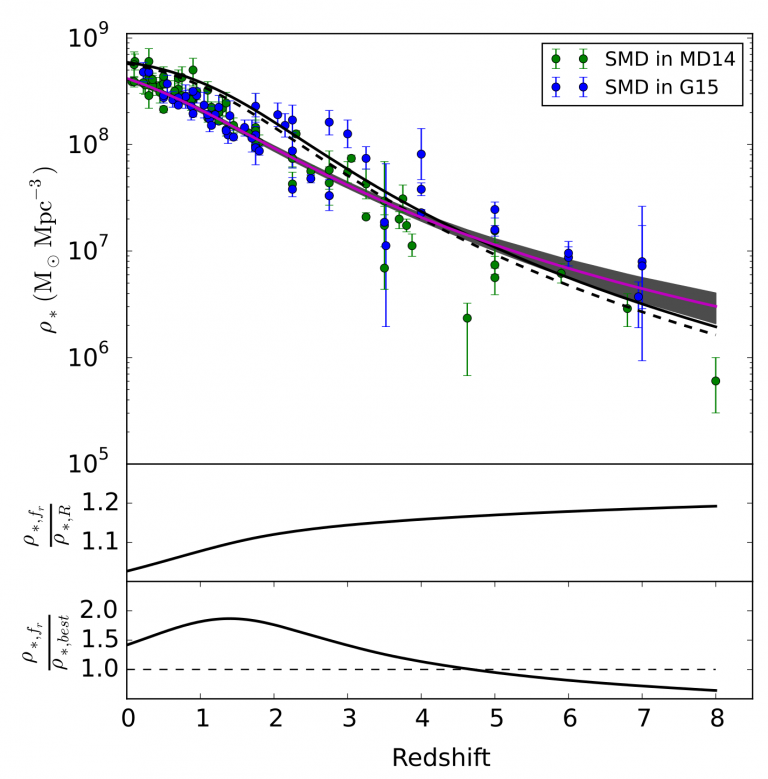 Figure 1, from today’s paper, shows the Stellar Mass Density (SMD) from recent observations – the stellar mass density is peaked at the current day (redshift zero). However, a key discovery over the past few decades is that the universe is not forming stars with quite the same enthusiasm as it once was. In fact, the peak of star formation activity in the universe was around ten billion years ago, or three and a half billion years after the Big Bang. Since then, the Star Formation Rate Density (SFRD, the mass in stars formed per unit volume) has been gradually decreasing. 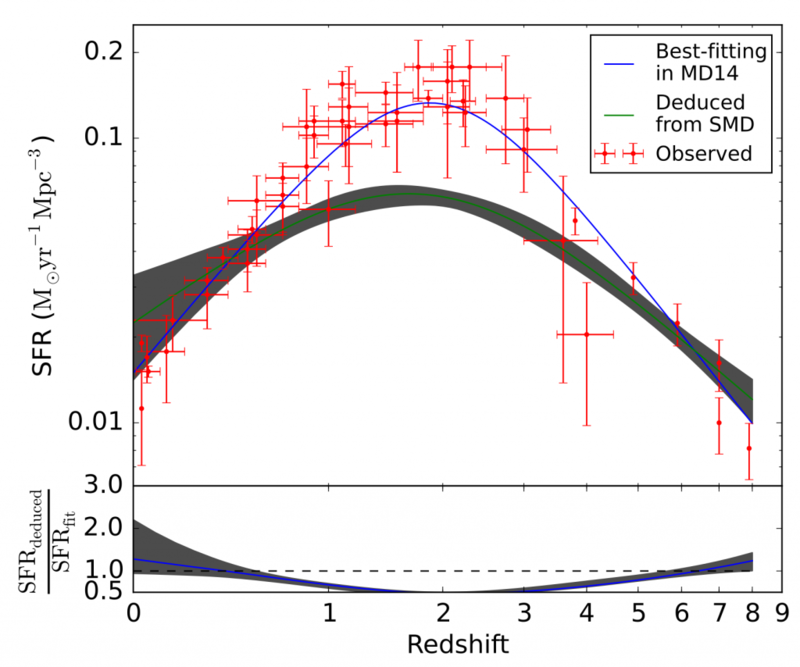 The red points in figure 2 show the observed SFRD over cosmic time. These two properties, the SFRD and the SMD, are clearly linked: if the SFRD is high, then the SMD in the future should also be higher. Similarly, if the universe were to stop making stars, we would expect the SMD to decrease, as massive stars died and were not replaced by new stars. Proxima Centauri is the closest known star to the Sun at just 4.246 light-years (1.302 parsecs) away. It’s a red dwarf of spectral type M6 with about 12% of the Sun’s mass, 1.2 times the diameter of Jupiter, and 0.17% of the Sun’s luminosity. It hosts the closest known exoplanet to us, Proxima Centauri b, which was discovered in 2016 as covered in this Astrobite. Like our Sun, it’s on the main sequence, steadily fusing hydrogen into helium in its core. Yet this tiny star is way more active than the Sun is! Red dwarfs like Proxima Centauri have interiors that are fully convective, meaning that the energy generated by fusion in their cores is transported to the surface primarily via convection. Like a pot of boiling water, you can think of it as being one giant ball of boiling plasma. This turnover of ionized gas generates powerful magnetic fields, which are carried to the surface along with the bubbles of hot plasma. When these bubbles reach the surface the energy contained in the magnetic fields can be violently released in the form of stellar flares, which can grow as large as Proxima Centauri itself and reach temperatures of up to 27 million K! 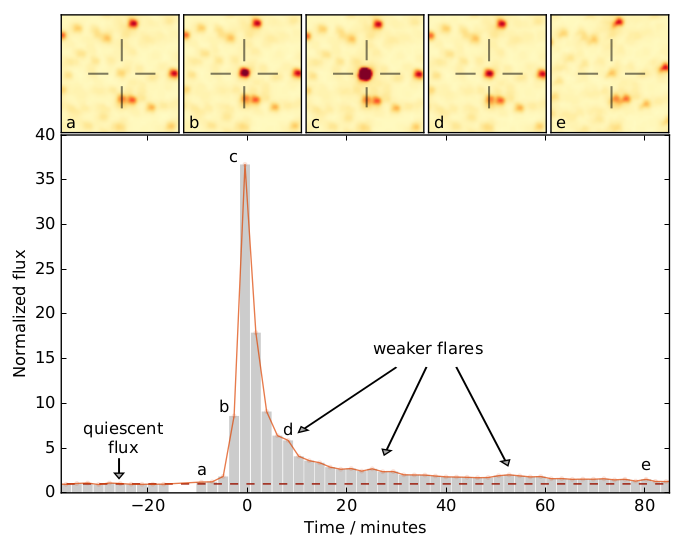 (Normally its effective surface temperature is around 3,000 K.) These flares from Proxima Centauri have been observed frequently in the past (for instance in this recent Astrobite).